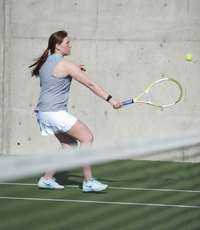 There’s a reason that Hailey’s Wood River High School for 38 years has sent many of its players to the Idaho High School Activities Association’s state tennis tournament. Wood River has always had knowledgeable coaches and has put together a challenging schedule that includes mid-season tournaments designed to prepare players for state. Last weekend the Wolverines tackled the first of two mid-season tournaments. This one was the eight-school Eastern Idaho Invitational for 5A and 4A schools in Idaho Falls. Wood River’s 16 players—several seeded high entering the two-day meet—did well at Idaho Falls, winning 23 of their 40 matches. Hailey coach Carlos Meza said the tournament showcased some of the best tennis players in the state. Idaho Falls, last year’s State 5A third-place girls’ finisher and state champion in 2011-12, won the Eastern Idaho girls’ championship with an overwhelming total of 89 points. The Tigers amassed the best combined record for the tourney: 89 points for the girls including championships in singles, doubles and mixed doubles, and 45 boys’ points for a grand total of 134 points. Another 5A school, Hillcrest of Idaho Falls, led the boys with 52.5 points plus 23.5 girls totaling 76. Hillcrest and Wood River dominated State 4A boys’ team titles from 2008-12 before Hillcrest moved to 5A. Century of Pocatello, last year’s State 4A boys’ champion and girls’ runner-up, finished third Saturday with 64 points (30 boys, 34 girls). Wood River was fourth with 45 points (27.5 boys, 17.5 girls). Twin Falls placed fifth with 44 points. Meza said, “Our players represented themselves and our school very well. On Friday, we battled extremely high winds to pull out some victories, and on Saturday, a long, long day of playing that brought fatigue to our players who were in the last rounds. Top boys’ singles player for Wood River was No. 3-seeded Danny Graves with a 5-1 record. Graves played his way into the semi-finals of the championship bracket where he lost to eventual winner Orin Duffin of Hillcrest in straight sets. Seeded No. 1 in boys’ doubles, Wood River’s Stephen Pfeiffer and Andrew Graves (4-1 last weekend) in the second round dropped a third-set tiebreaker 15-13 to eventual champions Hunter Mansfield and Cade Sutton of Century. Mixed doubles Andrew Pearson and Haley Cutler, seeded third, defeated teams from Minico and Hillcrest before falling 6-4, 6-2 in the championship bracket semi-finals to eventual winners Jesse Haas and Hannah Wright of Idaho Falls. In consolation play, Pearson-Cutler beat No. 4-seeded Justin Fullmer-Hailey Clayton of Bonneville. No. 4-seeded Alex Taylor and Sam Taylor (2-2) cruised through their first two rounds with wins over Minico and Twin Falls before falling in the championship bracket semi-finals to eventual winners Jordan Wright and Madison Wright of Idaho Falls 6-0, 6-1. Showing improvement in singles were Drew Morse (2-2), Oskar Wilander (1-2) and Josie Potts (2-2). Meza said Potts had an extremely respectful showing including a long three-set match that included two Potts tiebreaker victories. Other doubles teams with wins were Miles Remington-Clay Cutler (2-2) and Fernanda Lagunas-Cheyanne Stopol (2-2). Representing Wood River well in Idaho Falls was the mixed doubles team of Brady Delgadillo-Sophia Coplin. Wood River will host the Community School of Sun Valley today, Wednesday for a make-up meet at 3:30 p.m. on the Hailey courts. The Blaine County schools will also meet Tuesday, April 29 in a tri-meet with Canyon Ridge of Twin Falls at 3 p.m. at Sun Valley Tennis Club. The Cutthroat tennis team resumes action with a tri-meet Thursday, April 24 in Twin Falls at 12 noon against Idaho Falls and 3 p.m. against Skyline of Idaho Falls. The Cutthroats travel to Mountain Home Saturday at noon.